It looks like the biggest storm of the season so far arrives in California this weekend. I'm forecasting feet of snow, not inches, at the Lake Tahoe ski areas. Why is this happening? Take a look at the graphic. 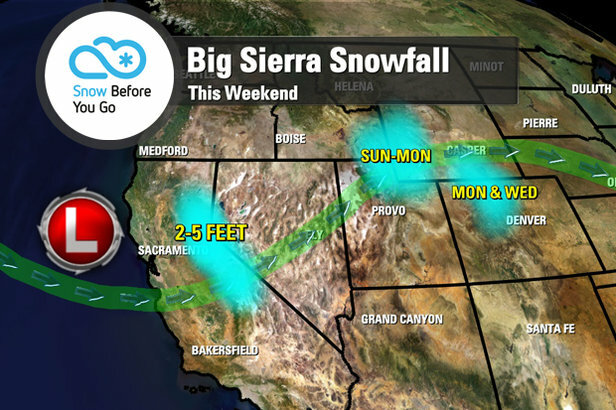 The storm track is shifting south and will slam directly into the Sierra Mountains this weekend. It's almost like pointing a giant hose at the ski areas for three days. Some of this snow will get ushered east into Wyoming and Utah on Sunday. California: 2–5 feet of snow will fall Saturday–Monday at all the Lake Tahoe ski areas including Heavenly, Kirkwood, Squaw Valley, Northstar and Alpine Meadows. Get out and enjoy all this powder! Rocky Mountains: The weather pattern turns more tranquil for Thanksgiving and this weekend. This includes Colorado, Wyoming and Utah. Snow returns to Wyoming and Utah on Sunday and again on Tuesday. I'm forecasting 6–8" at Alta and Snowbird from Sunday–Monday. A little snow hits Colorado on Monday, followed by a bigger snow on Tuesday–Wednesday. In Colorado, the avalanche danger will run moderate to high especially on northern aspects. Northeast: After a Nor'easter late this week, the weather quiets down this weekend. A quick moving storm could bring some light to moderate snow to the ski areas including Killington and Stowe early next week. Temperatures warm up this weekend as well. Tomer's Take: If you're looking for powder this weekend, head to Lake Tahoe. Then come back to Colorado early next week.